I picked this book up from work from our Abrams Publishing Rep. I am a huge fan of Peter H. Reynolds' art. He has done the art for many books I have on my shelf for my son. His art is whimsical and sweet. He brings the story to life so perfectly which each author he pairs up with. 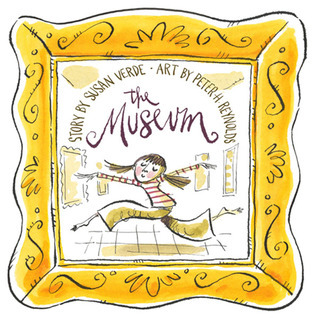 Susan Verde's words about a young girl's experience touring a museum are right on. She portrays the emotions that art can make us feel. The story also brings up the importance of creativity and expressing yourself. My son and I read it last night and he really enjoyed it. Sweet message and beautiful art work. Recommended to read to any child ages 3 to 10. This looks SO mega cute. I love it. Thanks for bringing it to my attention. You know I love whimsical.